Jazz Reporting Service 6.0.3 "New and Noteworthy"
Jazz Reporting Service is an optional program for Collaborative Lifecycle Management. 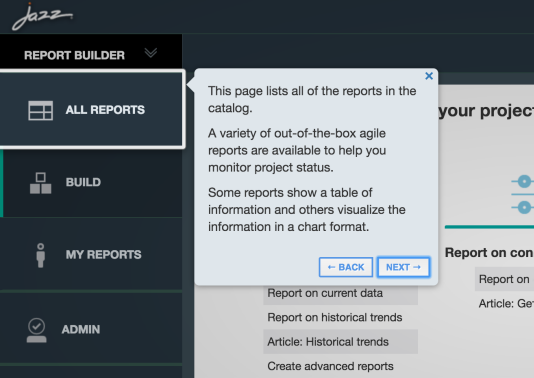 Report Builder is a key component of the Jazz Reporting Service, which you can use to quickly and easily consolidate data from across your applications and project areas. Depending on the applications that you use, and the type of information that you want to report on, you can choose to report on data that is collected in a data warehouse or that is indexed by Lifecycle Query Engine (LQE). 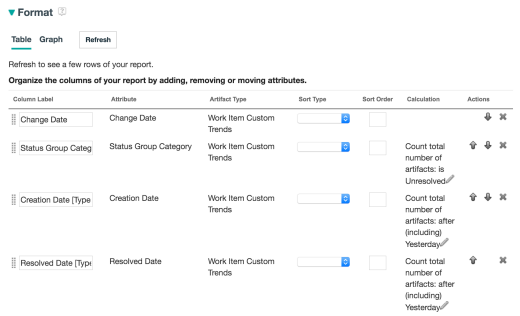 In Report Builder you can now adjust the order of the columns in the table report. Using the new action buttons on the side of the columns table, move the position of a particular column relative to the others. You can now drag and drop rows in the table to another position simply by clicking your mouse on the drag handle and dragging the row to the new location. To change the column width, in the Format section click the column borders and drag them to the width you want. 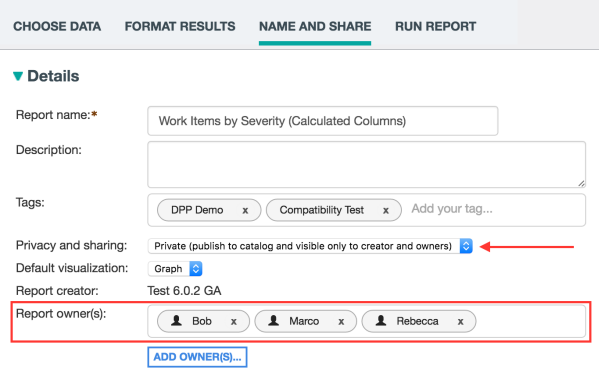 A report can now have multiple owners who can each make their own modifications to the same report. With multiple owners assigned to a report, if one person leaves, the remaining owners have the same rights and can assign new owners. You can add report owners on the Name and Share tab. You can also publish a private report to the widget catalog, even though the report is only viewable or editable by owners. You can then add the report to a dashboard without making it public, although only report owners can see it on the dashboard. If you are new to Report Builder, use the guided tours to learn how to use the application. On the Learn page, click Explore Report Builder. After clicking the link, you are guided through an initial tour. Additional tours show you how to create a report, configure a graphic report, and create a historical trend report. Add a custom title to the top of the chart. Show the values explicitly on bar segments or lines so that they are visible in a Microsoft PowerPoint presentation or an email. List a subtotal for each bar and a total for all the bars together. When viewing date values on the X-axis, it is useful to be able to group them into time segments such as weeks, months, or years. In historical trend reporting, when formatting a graph report, you could use the drop-down menu for the Date Scale. Now you can use this approach for any graph report that shows a date field as the primary group on the X-axis. For instance, you can now more easily make a creation aging report where you can see the age of open defects based on their creation date. First create a regular Work Item report, and then add a column for Creation Date. Then choose the Graph tab and ensure that the Group data by attribute field contains Creation Date. 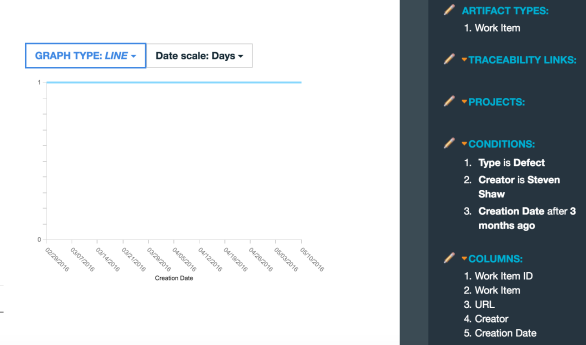 The default graph will probably be flat at first, because the creation date includes the time so each date value is unique, with a different entry on the X-axis. To see more interesting results, just change the date scale to weeks, months or years. Then the date values are grouped by that scale and you can see how work items are aging based on the conditions that you set. Aging reports show you a trend over time. There might be conditions on that trend that restrict the amount of data being visualized, so that no data is available at certain times. For instance, you might want a trend report of defects created by a certain person. You can easily create a Work Item report and then add a condition for Creator and Creation Date as a column. In this case, for days the query might not return any value. How do you interpret this in a chart? There are two valid scenarios: either the value is ignored, or the value should be zero. If the value is ignored, the line merely connects the previous day's values with the next day's value. This can be correct if you wanted to ignore certain days or if no data was collected. Otherwise, it should be possible to interpret this missing data as a zero result. This developer typically logs a defect every week or so, but definitely not every day. In this case the report provides a flat list for the daily trend since the gaps are ignored. To get an accurate daily view of defects created, you need to consider gaps as being a zero value. In the Date scale menu choose Fill in gaps with zero value. Then the graph fills in those date gaps with a zero value, and you can see when defects were logged versus not logged. Additional information is now available for many types and attributes. To see the details, hover over the question mark. In the report editor, you can adjust the size of several dialog boxes, including Add Conditions, Add Attribute Columns, and Add Calculated Value Columns, as well as the dynamic filters dialog box that you see when you run a report. Most reports that list a set of artifacts now offer filters in the dashboard so you can look for a specific value or ID. These text filters can now handle multiple values separated by a comma and a space. Now you can use a column that has a numeric value as the unit value that is visualized for any graph if you select Count values of a single attribute. You can also visualize a two-dimensional data set. For example, you can visualize the total number of comments per project and for each work item type within the project. Use the Units drop-down list to count the number of artifacts in the group (default) or select a particular numeric or calculated column. 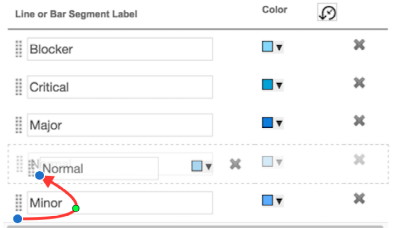 To adjust the order, grab the drag handles beside each label and move the row into the correct order. In this case, you'd move Normal before Minor. Now you can trace more complex paths from one artifact to one or more artifacts. This ability is useful when you need to add conditions for an artifact that is part of the traceability path, but you also want to include relationships to other artifacts in the report. 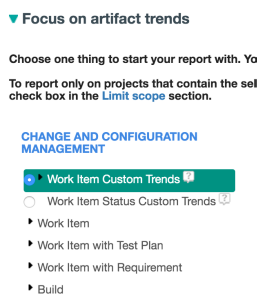 As an example, if you want to create a report that shows work items that were approved in the current iteration, you can trace from work items to iteration and also to approvals. To set up this report, you first create a traceability path from Work Item to Iteration. Notice the new Add a relationship button underneath the relationship link. Clicking on that button opens a new dialog box that guides how the branching will occur. 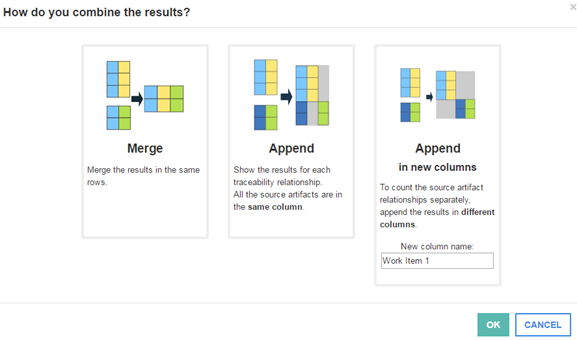 The box provides three options that show you what will happen to the results in your report. The first two choices start with the same artifact, so if Work Item 123 is traced to Iteration I2 and has an approval record, each row of the report shows the work item, iteration, and approval. The choice between Merge and Append merely affects the presentation. Either the trace artifacts are in the same row or on mutually exclusive rows. Use the third option when you essentially want to combine two separate queries without considering how the results might integrate. The power of this functionality is realized when you add conditions to the artifacts. 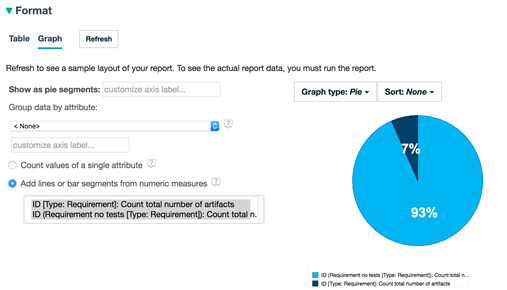 You can add conditions to Iteration and Approval to refine the report results. The new Iteration condition can ensure that only the current iterations are considered by checking that the start and end dates are in range of today’s date. The new Approval condition can specify only Pending approvals. The resulting report checks for pending approvals in the current iteration. The following example shows how the third choice, Append in new columns, can be useful. Often release managers want to see a summary pie chart of how many requirements are linked to test cases. This is easy if you use two traceability paths from Requirement to Test Case with different links. First, you create a required path from Requirement to Test Case which finds all requirements that explicitly have a link to test cases and no others. Then you choose Append in new columns and name the new artifact as "Requirement no tests". Then, you create a new traceability path from Requirement to Test Case with the new artifact but choose Does not exist as the link operator. At this point two distinct queries are appended together. You see a list of all requirements with test cases, followed by all requirements that don’t have test cases. 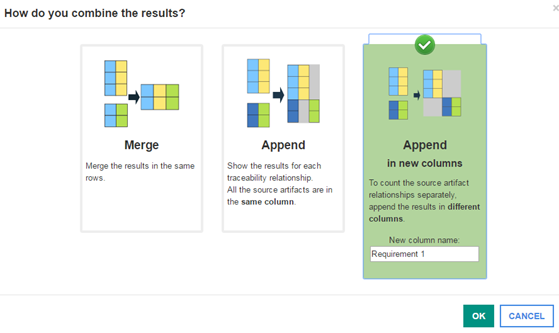 To visualize this, you can create two calculated columns that count the two sets of requirement artifacts. When you configure the graph, choose Add lines or bar segments from numeric measures and select Pie as the graph type. The resulting report is now a simple pie chart with a ratio of requirements with test cases versus no test cases. Now you can combine line and bar chart dimensions in the same chart report. 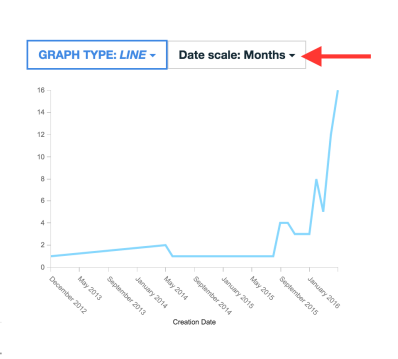 In the new column, you select the graph type for a particular dimension. 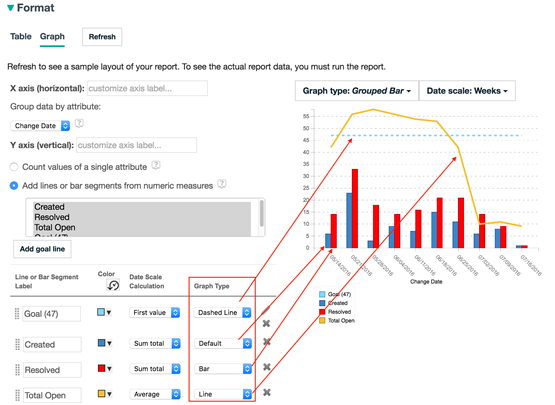 This graph type either assumes the default graph type of the report or can be locked to a specific graph type such as bar, line, or dashed line. In this example the goal line defaults to a dashed line since it’s a special case. 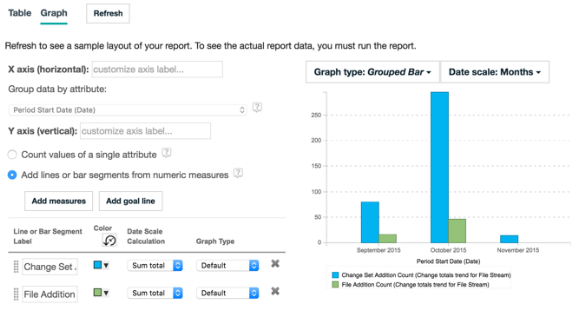 Created is set as Default so that data uses the default Grouped Bar type for the report. Resolved is explicitly a bar type so it is always represented as a bar, no matter what the default type of the report is. Finally, Total Open is set as line, and it is always shown as a line. Goal lines are useful to target an exemplary value or state to compare with in a report. Now you can add the goal line to any time series report. With the new hybrid reports you can also choose a goal line type: dashed line, solid line, or a bar. The line can be angled, curved, or an s-curve. 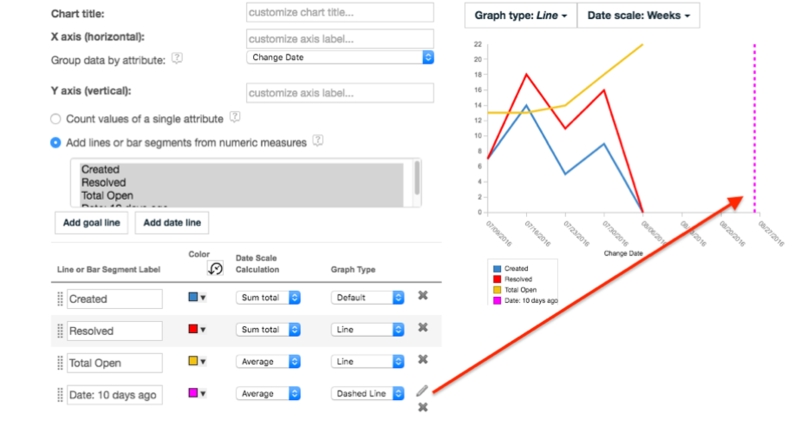 Click the Add goal line button when using the Add lines or bar segments from numeric measures option in the graph configuration. In this dialog box, select the type of goal line. Set the trajectory of the curve to make it more or less steep, and enter the starting and end values. Now you can add date lines to represent a milestone date. The date can be specific or a relative date, such as weeks before or after. Complex custom attributes now available for reporting (all data sources): Work Item, Iteration, Timeline, Release, Category, Contributor, Project Area, and Team Area. Some of these attributes correspond to an existing artifact type (such as Work Item, Iteration, Timeline, and Release) and are now available as traceability links from Work Item. The name of the link includes the name of the attribute and the word "(Custom)" in the appropriate locale. All the other complex attributes (Category, Contributor, Project Area, and Team Area) are available as additional attributes of work items. Historical metrics: Reporting on work item complexity (data warehouse) : Create a report that uses the complexity attribute of a work item. You can use this attribute to create a condition or a calculated column in a report. For example, you might want to calculate an accurate measure of the complexity of work items for a release or an iteration. The complexity attribute includes information about time estimates, time taken, and more. Traceability from test suites to test execution records (data warehouse): Report on Test Suite Execution Records from Quality Management. Rational DOORS Next Generation external links (data warehouse): Report on the External URL attribute of a requirement. Add this attribute to result columns of a report or to set specific conditions. Traceability from build artifacts to work items (data warehouse): Create links between Build and Work Item artifacts. Use the "Included in" (or "Includes") and "Reported against" (or "Reports") traceability links. Reporting on iterations, releases or timelines (data warehouse): In the Traceability links pane set up traceability from work item to iteration or release and then subsequently to timelines. 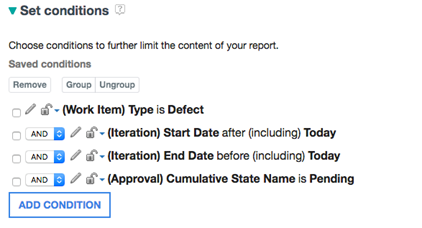 This action adds conditions or columns to your report based on the attributes of Iteration / Release or Timelines. Report on configurations (baselines and streams) (LQE): Report on configurations that are baselines or streams. There are two new artifacts available: Component and Configuration. Under Configuration there are three new types: baseline, stream, and global configuration. Configurations themselves are not versioned, so you must use the Lifecycle Query Engine data source and not the LQE scoped by a configuration data source. New "type" property for Requirement and Requirement Collection types (LQE): The type enumeration attribute was added so that you can report on multiple requirement types. Rational Team Concert has a capability to restrict access to specific work items based on users in team areas by category. Report Builder now respects this access and restricts report results about work items based on this special access control . You can turn this on in the administration page for your project. From there select the Categories side menu. The bottom section lists categories by team area where you can optionally restrict work item access to each category. Click on the Restrict Work Item Access check box to turn on this access control. The Data Collection Component (DCC) synchronizes this setting on the next DataMart run of its ETL jobs. This run is typically once a night unless the administrator runs it manually on request. Rational Team Concert stores a complete history of work item changes that is synchronized in the data warehouse in a Work Item History table. Now you can harness this table to do custom trend reports. You can also treat this table and the Work Item Status History table as trend tables and customize the work flow for them just like the other trend tables. These artifact tables have moved to their more logical location in the historical trends section. In the Focus on Artifact trend section there are new entries for Work Item Custom Trends and Work Item Status Custom Trends. Selecting one of these artifacts changes the flow to add the Traceability section in addition to the Set time range section. By adding traceability to the current work item you can facilitate drilling down in the final report. After setting the time range and adding conditions such as Planned For or Filed Against you can then continue to the Format results section. 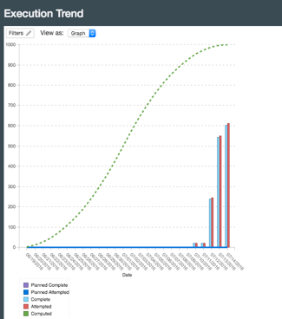 In this section the X-axis is automatically grouped by the Change Date which is when the baseline of the Work Item history was captured each day by the DCC Data Mart jobs. At this point it operates like a regular graph report, so you can add attribute data items to group by or calculated columns to visualize in the graph. It might be easier to switch to the table view of the report to ensure that all the data you need for the graph is in the columns. In our example let's create a graph that compares the total number of work items with work items created or resolved in a particular day. First, you create some calculated columns for those metrics. Switching to the table view you can see a calculated column has been added by default for convenience so you can visualize the total numbers on a given date. This approach is useful if you're simply looking for work item totals with conditions added on the Choose Data tab. You can remove that and add calculated columns for count of unresolved work items, and on creation date and resolution date. 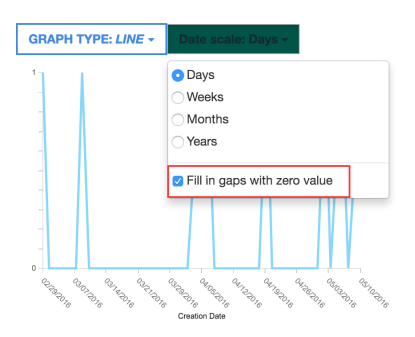 If you add a limit to a date field, for trend reports the Today value is relative to the trend day where the data is captured. Consequently you can do comparisons that count where a date field is equal to or close to the trend day (the number of creations or resolutions on a particular day). You can add calculated columns that measure the total unresolved work items, number of created work items and number of resolved work items for each trend day. Metrics are now available to report on historical trends of file stream artifacts, such as change sets and source files. With these trends you can develop reports about the total number of source files, number of new source files, and many others. You can also compare the number of change sets added with the number of source files. In this report, we can track how many files and change sets were added each month. Notice that October was a particularly productive month for source changes and additions. The type hierarchy for LQE-based reports is now simpler. Discovered RDF types are not shown in Report Builder, unless that RDF type is extended by more than one lifecycle tool. 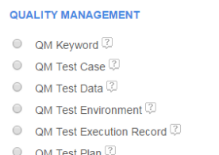 Thus the quality management group lists only the RQM artifact types. Although only one product (DNG) publishes requirement types, the Requirement and Requirement Collection artifact types are still shown because each of these RDF types is extended by multiple DNG artifact types. DNG supports components and RQM partially supports them. A project area can have multiple components that logically organize its resources, and each component can have multiple configurations (streams) to organize the different versions of the component's artifacts. Components are only available if the advanced server property for components is enabled in RQM and DNG, and if project areas are enabled for configuration management. Artifacts in a configuration-enabled project now have an extra property indicating the component of the project area to which the resource belongs. Likewise, every configuration also has an associated component. Therefore, Report Builder can effectively support components only for the LQE scoped by a configurations data source. In Report Builder, the property for an artifact type that indicates its component is shown as an enumeration attribute and not as a relationship property. 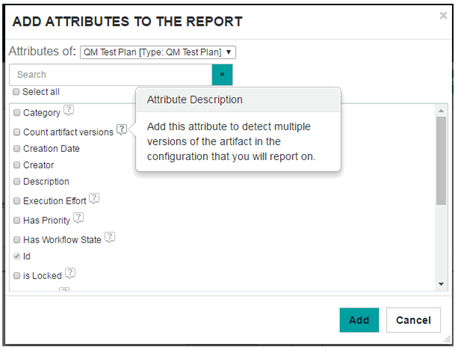 The report author can create conditions to restrict the artifacts that are returned in a report about specific components. Although the configuration chosen when running a report indirectly restricts the components, a global configuration can include multiple local configurations from the same tool and thus multiple components. When a condition is created for the "component" attribute, the possible values are shown in a two-level hierarchy of project areas and their components. In addition to conditions, you can add a "component" column to a table report. In this case only the component name is shown and not the project name. The dynamic configuration picker hierarchy now has four levels -- project, component, stream, and baselines -- to help organize the configurations. In addition, you'll always see a "component" dynamic filter and many times a "project" dynamic filter. Both the project and component filters are loosely connected to the configuration picker. If you don't select anything in either the project or component filter, the configuration picker shows all projects, all components in those projects, and all streams (and baselines) associated with each component. 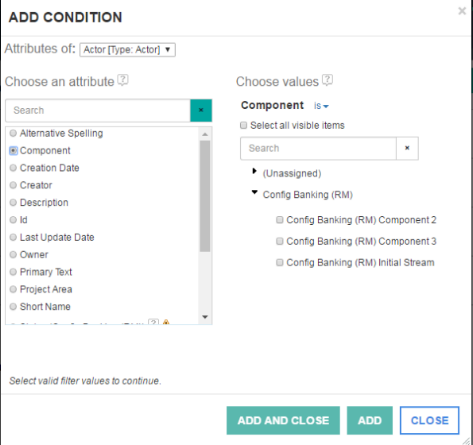 If you select one or more values in the project filter, only components for those projects are listed in the component filter and configuration picker. If you select values in the component filter, only those components are shown in the configuration picker along with their streams. The design of configuration management ensures that a local configuration of a component has exactly one version of each artifact in that component. Each artifact is uniquely defined by its URI (concept URI) and not by its name. When child streams or baseline configurations are created, each such configuration can link to a different version of the same artifact. 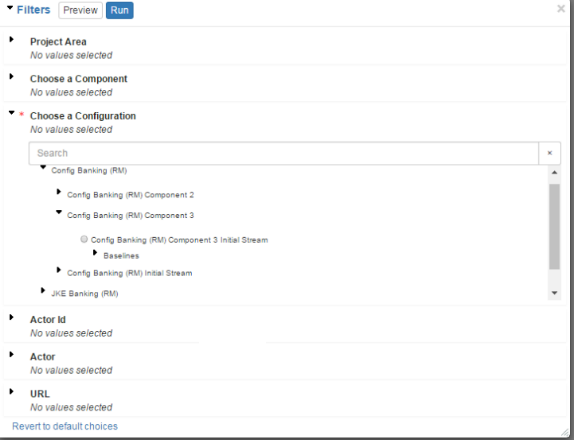 1) The global configuration includes 2 streams from the same component (such as parent and child streams). In 6.0.3, the tools prevent this situation by using only one of the streams from the same component. In the future, this restriction might be removed. 2) A user can clone (refactor) an artifact from one component to another, so that both components contain a copy of the same artifact. This is not a move operation. If the global configuration includes the streams from both components, then there will be multiple versions of the refactored artifacts. A new attribute called "Count artifact versions" has been added to all artifact types in Report Builder. Use this attribute only for reports that use the LQE scoped by a Configuration data source. Because of how this version count is computed, there is no way to add a condition for this attribute, so you must use the Add Attribute Columns section. However, when the attribute is added as a column to a report for a given artifact type, the resulting count indicates how many versions exist of each corresponding artifact instance in the configuration that is used to run the report. In most cases, the count will be "1", indicating a single version of the artifact. A larger count indicates component skew. If you want to find all artifacts with multiple versions, add the "Count artifact versions" attribute and make it the first column used for sorting, in descending order. When the report is run, all the artifacts with multiple versions are listed at the top of the report results. You can now create historical trend reports from an LQE data source. The Historical Trends report type is visible for LQE data sources that have been enabled for metric collection (see the Lifecycle Query Engine section below for additional details on how to enable and configure historical metric collection). The workflow for creating a historical trend report against an LQE data source is the same as for a Rational Data Warehouse data source. 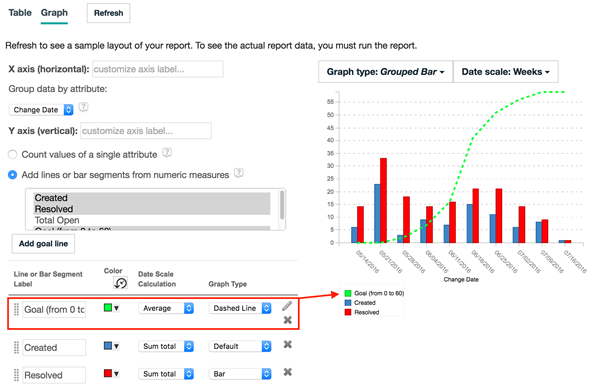 Select the trend to report on, choose the date range to run the report against, and format the resulting graph. Currently, the set of trends available is a subset of the trends available for the data warehouse. 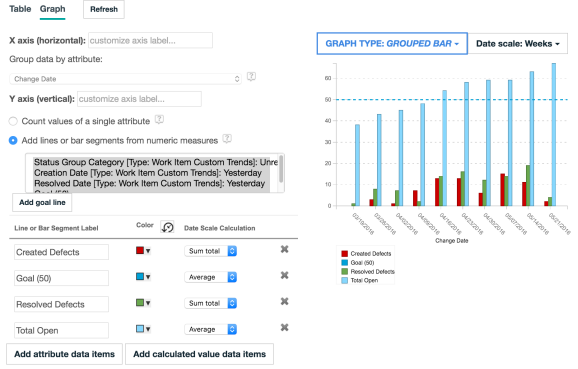 After you select one or more trends you can configure the graph in the same way as trends using the Data Warehouse data source. A new ready-to-copy report called Execution Trend is now available. You can duplicate this report and modify it to meet specific needs or use it as-is by setting the runtime filters. The report shows the actual and planned test execution progress based on test case weight (points completed and attempted). 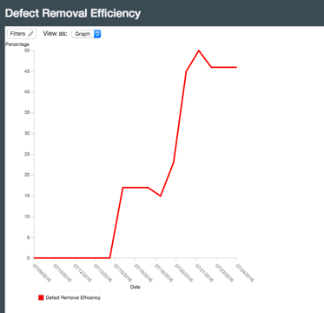 Another new ready-to-copy report is called Defect Removal Efficiency. Again, you can duplicate and modify it to meet your needs or use it as-is with runtime filters. It calculates the Defect Removal Efficiency (DRE) metric as how many defects were closed divided by the total number of defects. Lifecycle Query Engine (LQE) implements a linked lifecycle data index over data provided by one or more lifecycle tools. A lifecycle tool makes its data available for indexing by exposing its data by using a tracked resource set, whose members MUST be retrievable resources with RDF representations, called index resources. An LQE index built from one or more tracked resource sets allows SPARQL queries to be run against the RDF dataset that aggregates the RDF graphs of the index resources. Thus, data from multiple lifecycle tools can be queried together, including cross-tool links between resources. Administrators can now configure LQE to collect data metrics that can be used to create historical trend reports. Metric collection is not automatically enabled. You must configure and schedule tasks to collect data. To learn how to create and schedule data collection tasks, read the product documentation. DCC can now pull Team Area-based read access control data for work items. This capability allows finer-grained read access control of work item information in the data warehouse. The "Migrating the Clear Quest ETL from Data Manager to DCC" wiki page (https://jazz.net/wiki/bin/view/Main/MigratingClearQuestETLFromDataManagerToDCC) provides an example of creating a DCC-based ClearQuest ETL operation.